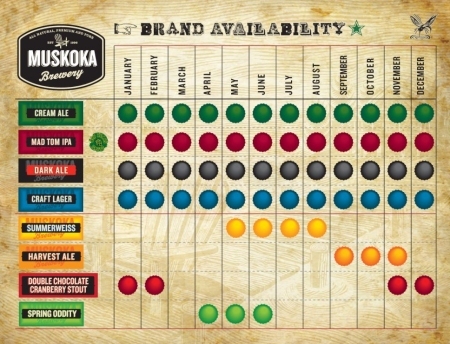 BRACEBRIDGE, ON – In a “Brand Availability” chart posted yesterday on Twitter and Facebook (and included above), Muskoka Brewery revealed the name of the long-rumoured spring addition to their seasonal beer line-up. Muskoka Spring Oddity will be available from April until June, following the soon-to-hibernate Winter Beard Double Chocolate Cranberry Stout, and overlapping slightly with the returning Summerweiss. (It) will be an interesting spring beer. Some wild ingredients, higher in alcohol and ‘fresh’. Both in the ‘not old’ way and in the ‘Bel Air’ way. There will be four launch parties for it across the Province and would like all our Facebook cronies to be at one of them. The thaw of a Muskoka winter unveils some of the strangest creations one can imagine. Legends date back to the 1800’s when lumberjacks and fur traders took to the woods and encountered the mysterious culture and wildlife in the unknown Northern Ontario region. Our Legendary Spring Oddity brew is the result of gathering unique ingredients throughout the fall and winter and creating something that reflects a revival in Muskoka. More details on this mysterious new brew will be posted here on CBN as they come to light.